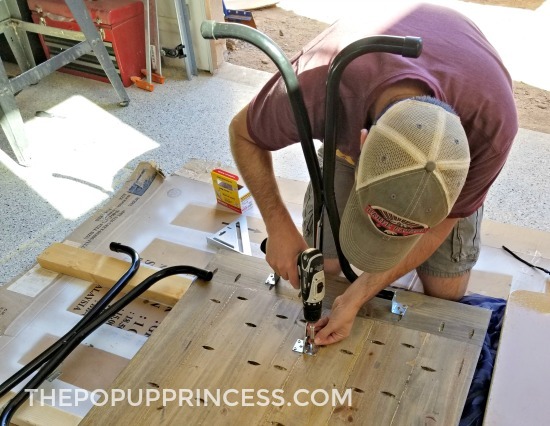 Here is how to build a simple farmhouse style camper table for under $100 using a Kreg Jig. 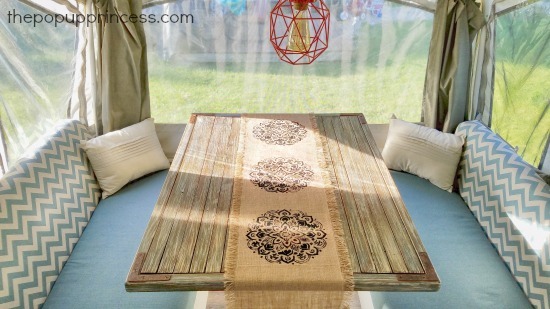 It’s a perfect way to replace a worn or missing RV table and can be customized to fit your style and decor. 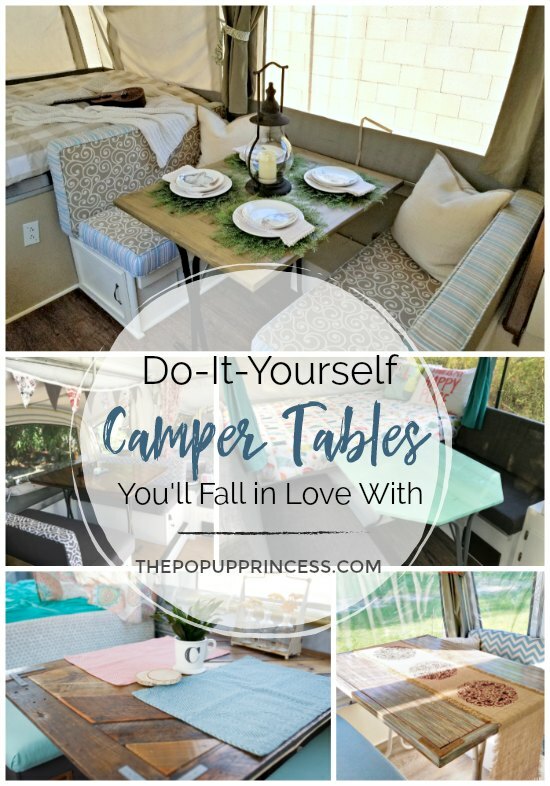 I’ve featured some beautiful custom camper tables from a few of my readers over the past couple of years. In fact, it is one of the projects that I am most often asked about. I first featured Becca’s table a couple years back. 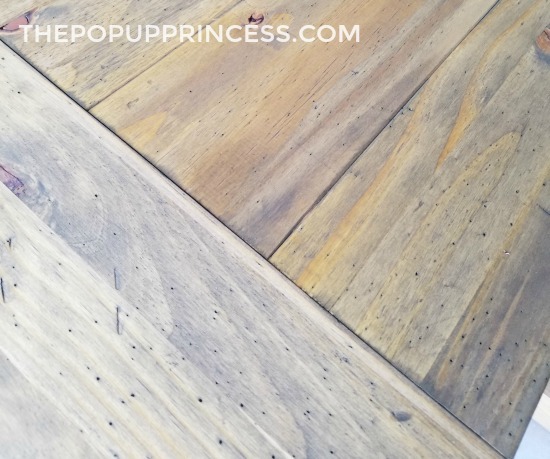 Becca attached weathered planks to the top of her original table, and the results were gorgeous. She really was the one who inspired so many other readers. 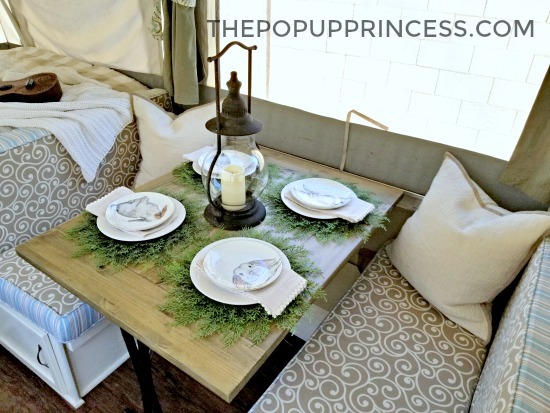 Readers like Tracy, who wanted to build her own custom camper table to complete her remodel. 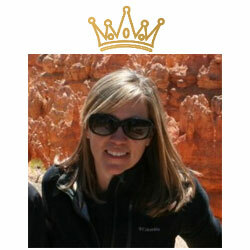 Tracy was inspired by Becca, but wanted her table to reflect her own tastes. 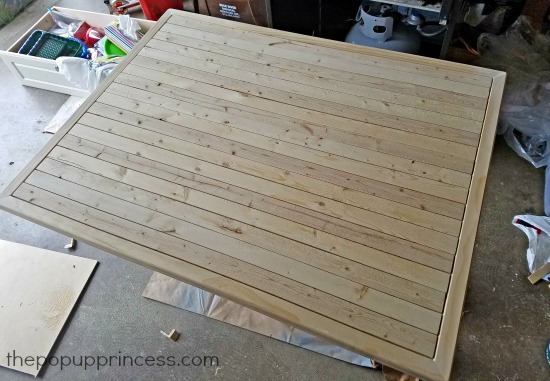 She put a unique spin on her planked table, and the result is nothing less than stunning. Everyone loves this table, and it’s not hard to see why. Tracy attached inexpensive wood lath strips to her existing table top, then used a dry brush technique to make her planks look weathered. 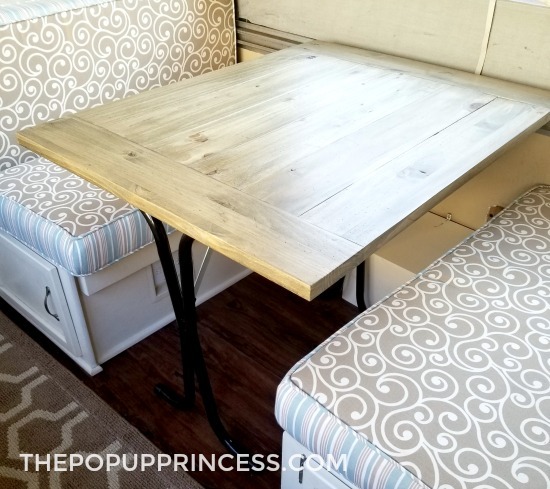 Even though she used brand new wood strips, the table has a beautiful rustic finish. Didn’t she do an amazing job? 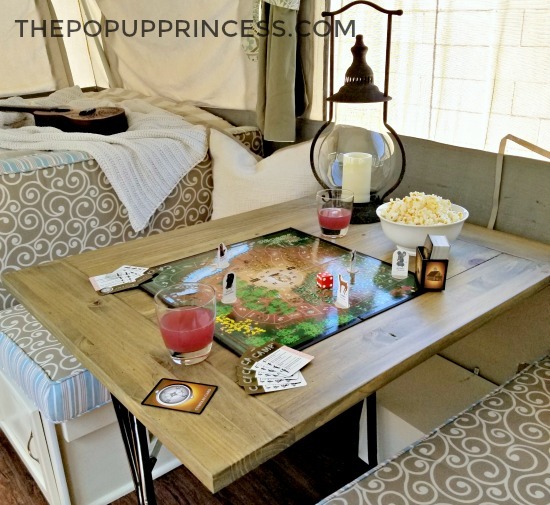 I have been itching to make a few changes to our pop up camper for a few years now, and a new table seemed like the perfect project. 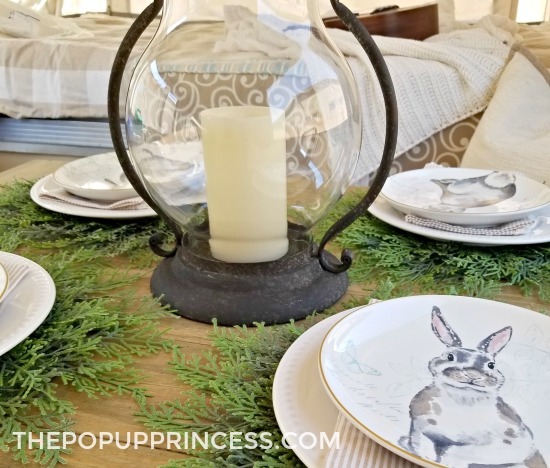 I am a huge fan of farmhouse decor and have two farmhouse tables in my own house. One is made from 100+ year old barn wood, and I just love it. Naturally, I wanted to build a table that would make our camper feel like home, so a farm table was a no-brainer for me. Selecting the right wood was essential for this project. 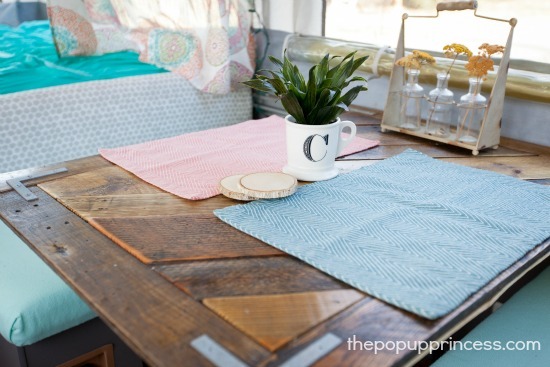 While I love the look of 100+ year old barnwood, it wasn’t practical to use it for the camper table. We needed something much cheaper but also very sturdy. Most of the time, our camper table serves as a base for the extra bed, so it needed to be able to support a person’s weight. We found that inexpensive stair treads worked perfectly for us. Each 11 1/2″ wide stair tread is made up of several individual boards. The grain of each board alternates. You can see that in the pictures above. This makes the stair tread much stronger than a simple 1 x 12 board. We bought four treads at $12.97 each. Each tread made two 5″ wide boards. Make sure that you start at the straight edge when ripping your boards. 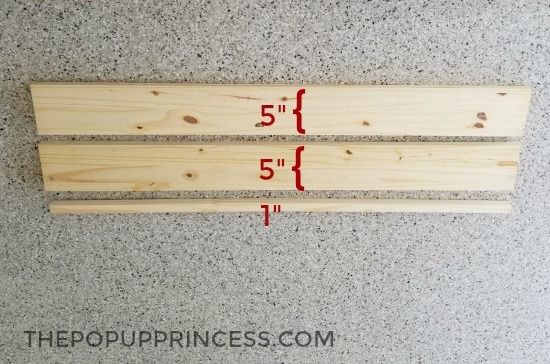 You’ll have just less than 1″ left over after you cut two boards, and that 1″ should be the rounded edge meant for the stair. Then we laid six planks to form the center of the table. We examined each side for knots and cracks, but we also looked for cupping and warping. The nice thing about using stair treads is that the boards themselves are pretty straight. Once we were satisfied with the layout, we numbered the planks and used a hammer and a few screws to distress the them a bit. 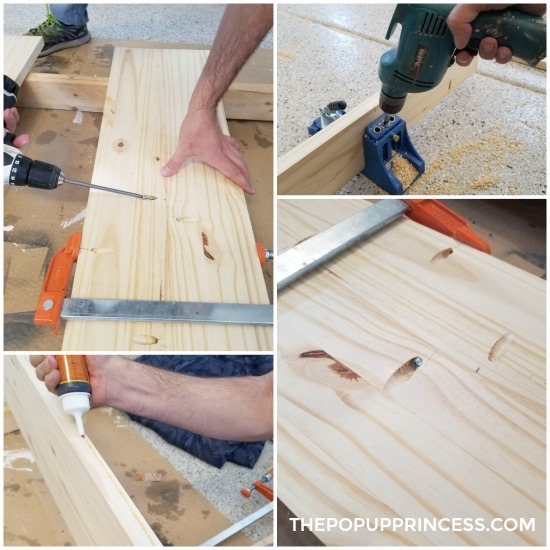 We cut our center boards 29″ long and gave them a small bead of Gorilla Glue on the joints. 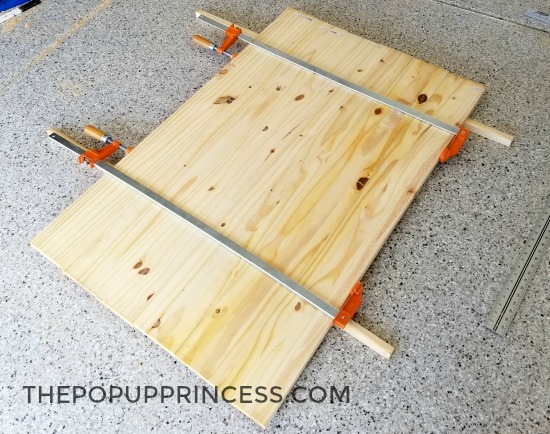 Then we used the Kreg Jig method to join the boards together. It was incredibly easy. 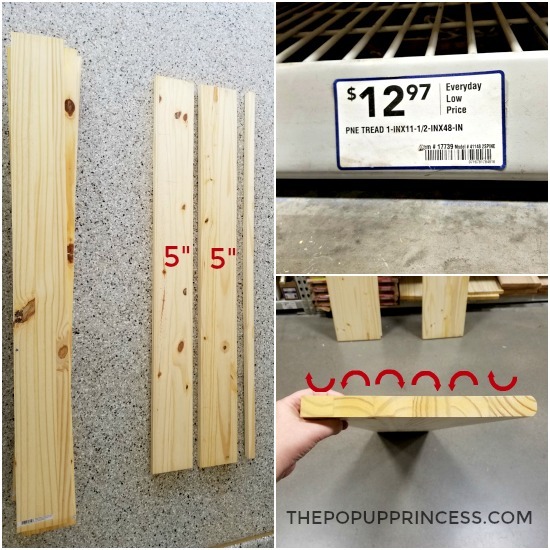 If you don’t have a Kreg Jig, you can simply glue the planks together at the joints and brace them from underneath with a strip of 1 x 2. Just make sure that if you are using fold away legs, you don’t interfere with the placement of the leg brackets. Once we got the center of the table put together, we attached the breadboards to either end. 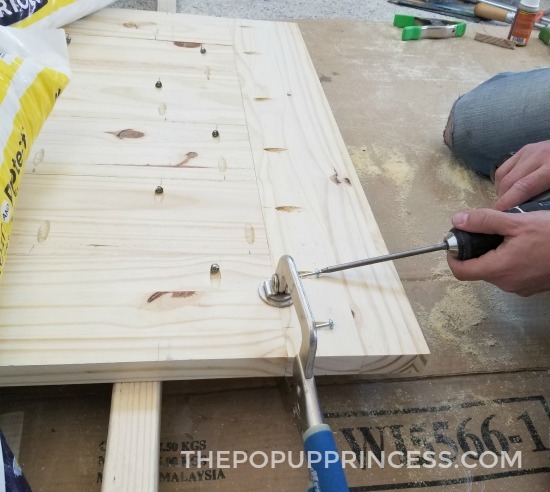 The final width of the table is 30″ so we cut the breadboards just over 30.” Next we attached them to each end of the table with Kreg Jig screws. Lastly, we squared everything up with our t-square and handheld circular saw. This removed about 1/4″ of the width from either side. Here’s what the table looks like from the underneath. You can also see the final dimensions. We double checked that it fit along the brackets under the dinette and laid flush, which it did. 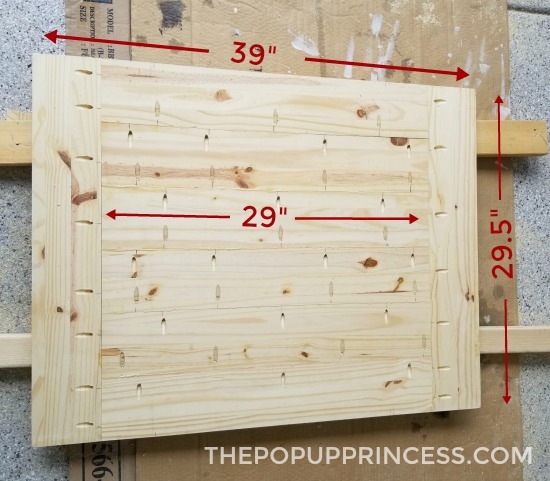 If you don’t like the look of breadboards, you can simply cut your table planks to 39″ and join them together. Once the top was complete, I gave it a thorough sanding. I started with 150 grit sandpaper and worked my way down, finishing up with 400 grit sandpaper. I wanted the table to look weathered, but I didn’t want splinters in our elbows either. Mr. TypeTwoFun gave the whole thing a single coat of our favorite Minwax Driftwood stain. I love this color. It isn’t too gray, but it isn’t too orange either. It is really hard to photograph how it actually looks, but above picture is a more accurate representation of the color. My camera makes it look orangey for some reason, but it really isn’t. It looks like driftwood you’d find on the beach. 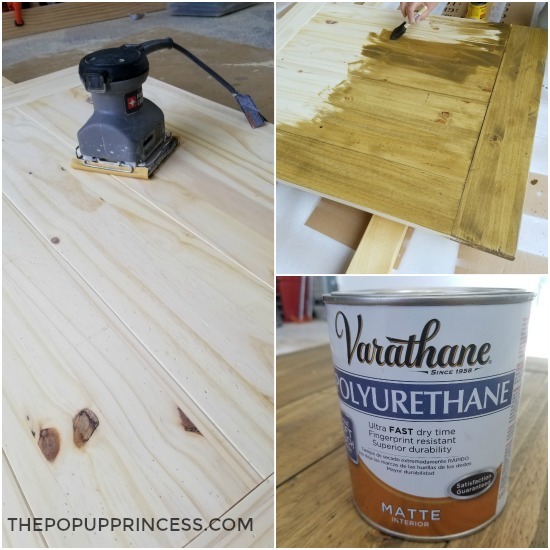 Once the stain was dry, we followed up with three coats of Varathane Matte Polyurethane. This clear coat is great because it really is very matte. You can hardly tell there is a protective coat on the wood at all, but it does a fabulous job repelling stains. Spills wipe right up. We considered spray painting the original legs and attaching them to the new table top, but decided against it in the end. 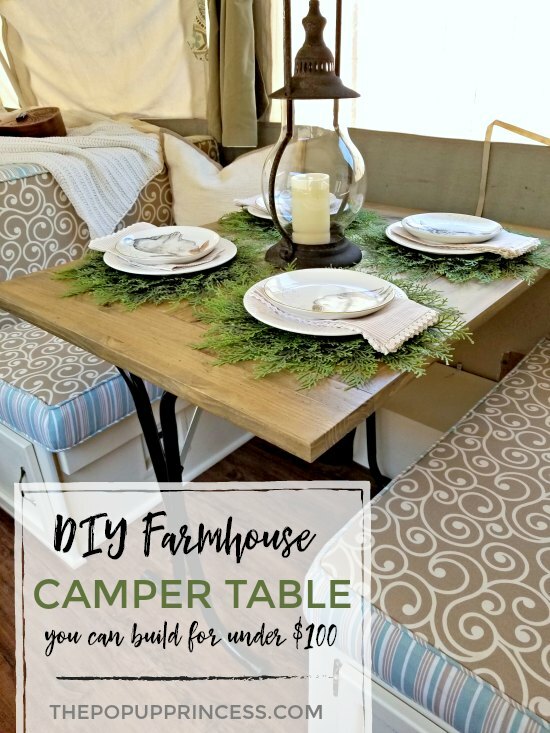 I loved our new farmhouse table so much, I wanted to be able to keep it if we ever sold the camper. That meant looking for replacement legs, but authentic Coleman pop up camper folding legs are SO pricey. I found sets online that were running around $150, and that was definitely out of our price range. We settled on these generic RV legs, which I purchased on Amazon. These legs are almost a perfect match for the original table legs. Even better? A set of two legs only cost me less than $40. 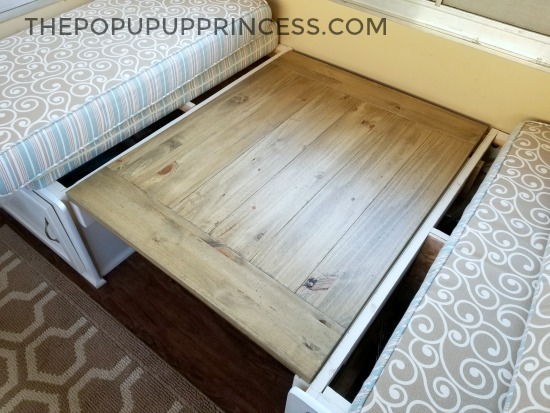 Like the originals, these legs fold up and out of the way when we are putting away the camper or using the dinette as a bed. We set them back 10″ on one side to accomodate the wheel well. If your wheel well is located under the dinette, you’ll want to do the same. All in all, we kept the cost of the table under $100 total. We already had a Kreg Jig and a large stash of stains and polyurethanes at our disposal, so that helped us stay within budget. Considering that replacement Coleman tables are going for around $200 used, I thought we did pretty well. 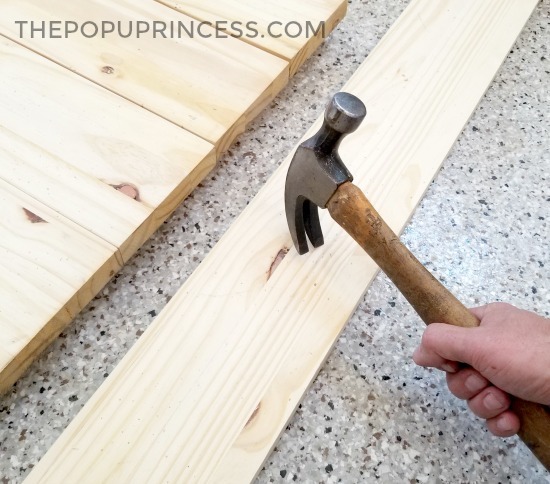 You can definitely make this table on a slimmer budget by selecting construction grade pine boards and reusing your original table legs, if you still have them. Now, of course, I want to make more changes to our camper. It’s been four years. It’s time, right? 😆 I’ve promised Mr. TypeTwoFun we won’t do anything major until after our big summer trip, but I can dream for now. And since I still had some of our Easter place settings out on the dining table in the house, I just had to stage the dinette for a few pretty pictures. It will NEVER look like this when we are camping, but the PUP is set up in the backyard right now, so I can play (and dream) in it when I have a few extra minutes. Just look at that gorgeous finish! It is so pretty that I am never going to want to use this table as a bed. The kids can sleep on the floor, right? There you have it! It was such an easy project, but I love knowing that we made it together for our family to gather around. I can definitely see us playing games–or even enjoying a meal in stormy weather–around this table for years to come. 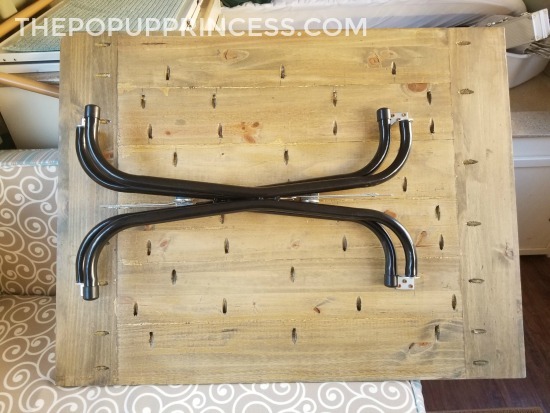 And if farmhouse style isn’t your thing, check out some of our other features for some more creative table projects. You are sure to find something that fits your style. Looks great! I want one. May I ask how you mounted the table legs? I have ordered a set but it states the are no instructions. No, we don’t have a ledge along the wall. We built a wooden box around the wheel well, and that is probably what you are seeing. The table rests on two wooden bars along the front of each bench. We do have a tutorial on how to add doors to the storage dinette, if that is what you are looking for. You can find that here. The table looks great! I’ve used the Driftwood stain on several projects, and I always love the finished product! Mr. Type Two Fun would be so bored without you and your creative mind!